Do American alliances provide stability at acceptable cost and risk to the United States, or do they ensnare the U.S. in wars it need not fight? The debate is a key one: if alliances entangle, it would seem prudent for American leaders to heed the advice of President Thomas Jefferson, who prescribed “peace, commerce, and honest friendship with all nations, entangling alliances with none,” as well as President George Washington, who in his farewell address famously warned his countrymen to dodge alliances so not to be drawn into the “quarrels” of others. In his article, Michael Beckley has constructively advanced this important debate; this review essay summarizes his research design and findings, and raises questions about both that should be the focus of future inquiry. The data appendix is available from the author’s website (http://www.michaelbeckley.org). Advocates of ‘deep engagement’ argue that U.S. alliances deter conflict across key regions of the globe. They enhance deterrence, dampen regional rivalries, reduce the spread of nuclear weapons, nurture democracy, and facilitate economic interdependence. Critics (advocating a strategy of ‘restraint’ or ‘offshore balancing’) dispute the stabilizing effects of American alliances; they warn that the world will balance against the preponderance of American power, that the burden of empire and free-riding by allies is financially unsustainable, and that U.S. alliances will entangle the United States in unnecessary wars. In recent years, scholars have usefully begun to clarify and empirically test the micro-foundations of these strategic visions. For example, the deep engagement strategy asserts that other countries’ wars devastate the U.S. economy; Eugene Gholz and Daryl Press tested and rejected this hypothesis. Offshore balancers predict that the world will balance against American power; some scholars argued that countries were doing so via ‘soft balancing.’ But Stephen Brooks and William Wohlforth, Keir Lieber and Gerard Alexander rejected much of what was being deemed ‘balancing’ as just politics as usual, not to be construed as a cost of the U.S. grand strategy. Offshore balancers also warn that hegemons will be weakened by overstretch. Not so, argue Sebastian Rosato and Michael O’Brien, who dispute the diagnosis of overstretch in several historical cases, and in the U.S. case the United States today. The move by these and other scholars to develop and test the various hypotheses that undergird different grand strategies has significantly enriched U.S. national security debates. Beckley’s “The Myth of Entangling Alliances” makes a notable contribution to this broader, very constructive, trend. Beckley notes that he seeks to examine to what extent American alliances “entangle the United States in wars it would otherwise avoid” (7). He builds on scholarship about alliances to define entanglement, develops competing hypotheses, and teases out mechanisms through which states do or do not become entangled. According to Beckley’s entanglement hypothesis, alliances “drag states into wars by placing their reputations at risk, socializing their leaders into adopting allied interests and norms, and provoking adversaries and emboldening allies” (9). Beckley usefully develops a rival “freedom of action” hypothesis (discussed below) to test against entanglement theory. Beckley develops these mechanisms theoretically and tests the two theories against a dataset consisting of every militarized interstate dispute (MID) in which the U.S. participated during the 1948-2010 period—a total of 188. He searches for cases featuring evidence of an alliance drawing in the United States, and isolates five conflicts (comprised of 18 MIDs). Beckley then scrutinizes those five cases and argues that he finds mixed evidence of entanglement. Overall Beckley concludes – based on the preponderance of non-cases, and mixed evidence in the five cases – that the risk entanglement is low; that, as the deep engagement school has argued, American alliances may safely continue. Or should they? A few comments are in order. Entanglement can be conceptualized as the pressure that a country feels to engage in a conflict because of an alliance—pressure it would not feel if the alliance did not exist. Beckley usefully discusses the methodological challenges of how to recognize a case of entanglement, warning against coding “cases in which the United States backed allies for self-interested reasons as cases of entanglement” (10-11). He argues that entanglement occurs when “an alliance drags a state into a military conflict against its national interest” (13). A problem with this measurement is that its overly narrow definition of entanglement may overlook cases of the phenomenon in the empirical record. Beckley searches for cases of MIDs “in which alliances caused U.S. leaders to deviate from the strict pursuit” of national interests (24). But what if, as Beckley hypothesizes in his theory development (14-15), alliances entangle because they begin to be seen as ends in themselves; alliance preservation itself, and thus a reputation for keeping commitments, becomes seen as a vital national interest. But what if the two are the same? ‘Self-entrapment,’ after all, is not some strange cousin of entanglement; it is entanglement – it is one hypothesized process that draws countries into war, examined by IR theorists in the alliance literature, and warned about by offshore balancers in grand strategy debates. Indeed, from Korea, to Vietnam, to Bosnia, to Libya, to President Barack Obama’s ‘red line’ in Syria, debates about U.S. intervention are thick with admonitions that ‘Our Credibility Is On The Line.’ In this familiar pattern, many U.S. leaders and foreign policy elites today argue that, in the event of a war in the Taiwan strait, the United States must defend Taiwan or see its credibility collapse. Yet all the while, U.S. allies in Asia make it clear that they under no circumstances want war in the Taiwan strait, and fear that the Americans will someday fight one with China. What Beckley would diagnose as illogical self-entrapment is precisely entanglement: calls for intervention in a conflict (involving a non-ally, no less) because the existence of other alliances (and concerns about their credibility) have led foreign policy elites to redefine the U.S. national interest. Beckley reports that he finds 170 MIDs in which the United States intervened to uphold “strict national interests” (24) and 18 MIDs in which he finds some evidence of entanglement. He then subjects the 18 MIDs (which were five broader conflicts) to closer scrutiny: an exercise that leads him to conclude that evidence of entanglement in those cases is at best mixed. In other words, lawyer Beckley calls only cases of alleged entanglement to the stand, where he questions them until declaring to the jury “the overall level of entanglement is limited” (2). Beckley, however, has interrogated no cases of non-entanglement. The reader wonders, if he had, could those cases have withstood a similar tough cross-examination—or would this have revealed evidence that alliance credibility concerns did indeed play a pivotal role in decisions to intervene? While this counterevidence is not probative, it begs the question of what a deeper interrogation of the 170 cases of ‘non-entanglement’ would reveal. To be fair, a research design that relies upon process tracing of 188 cases would of course not have been feasible. But Beckley’s method of measuring entanglement—which may have obscured cases of entanglement in those 170 MIDs—suggests we need closer scrutiny of the data before we can feel confident that alliances do not entangle. A debate about entanglement also needs to help us wrap our heads around what a little bit of entanglement (an acceptable level) looks like, versus what a concerning amount (an unacceptable level) looks like. Beckley argues that out of 188 cases at best he finds 18 MIDs that reflect entanglement (the ones he left broken and weeping in the witness stand). Thus he concludes that the costs and risks of entanglement are minimal. But the cases Beckley identifies as entanglement-ish are a rather noteworthy list of ‘exceptions’ to a rule that alliances do not entangle. As Daniel Drezner commented, “saying that there’s a robust finding ‘except for Vietnam’ leads one to think that this is a pretty big exception.” The five cases – and, if you agree that the Korean War and the Berlin and Cuban missile crises belong in the mix –include the most calamitous wars that the United States fought during the Cold War, plus the crises that brought the United States closest to the brink of nuclear war. If this is a little entanglement, one shudders to think what a lot looks like. Future studies should help us gain purchase on the question of how much entanglement is too much (and how to measure ‘much’ to begin with). And how much entanglement would we need to see before even the most unabashed deep engager would start to cough, um, guys, I think we have an entanglement problem. Most of the evidence in Beckley’s study draws from MIDs involving the United States during a period of bipolarity. This creates problems for the generalizability of his argument—both for U.S. foreign policy and for IR theory. First, there are good reasons to think that under conditions of bipolarity, entanglement risks should be lower relative to unipolar or multipolar systems. As David Edelstein and Joshua Itzkowitz Shifrinson argue, “Claims that entrapment today is unlikely because entrapment was rare during the Cold War may therefore be right on the history but wrong on the implication.” Namely, one might agree with Beckley’s coding that the 170 MIDs reflect little entanglement, but still be concerned that in the current unipolar period, the risk of entanglement facing the United States is higher. Furthermore, another question about the study relates to its broader generalizability to international relations theory. The article sometimes shades into discussion of the general phenomenon of entanglement, but focuses its empirics and its policy implications on the United States. But the United States, of course, is an unusual ally in many ways; in the future, international relations theorists should build on Beckley’s study to examine the broader IR phenomenon. Many other countries, of course, worry about entanglement. During the Cold War, the Japanese were frightened of being drawn by the U.S.-Japan alliance into American wars. Today many Australians worry about being entangled by “Australia’s Dangerous Ally.” In short, the phenomenon of entanglement requires further study before the article’s findings may be generalized to U.S. foreign policy in the current period, or to international relations theory more broadly. One of Beckley’s key contributions is his development of a “freedom of action” hypothesis – the means through which allies protect themselves against entanglement. Beckley hypothesizes that allies do so by “inserting loopholes into alliance agreements, sidestepping costly commitments, maintaining a diversified alliance portfolio…and using explicit alliance commitments to deter adversaries and dissuade allies” from provoking conflict (9-10). Evidence suggests the plausibility of this hypothesis: for example, as mentioned earlier, Japan had (and has) profound fears of entanglement in American wars, yet its leaders have managed to avoid entanglement and, more broadly, to reduce Japan’s contributions to the alliance far below the level sought by Washington. Beckley’s research design, however, cannot adequately test the freedom of action hypothesis (and, by implication, the entanglement hypothesis). A research design that examines MIDs involving the United States cannot test a hypothesis that predicts non-intervention and even non-MIDs. In fact, Beckley’s research design may understate support for the freedom of action hypothesis. Namely, every case in which a U.S. ally went to war, but Washington avoided involvement, would be evidence in favor of the freedom of action theory—but would not appear in this dataset. Future work should thus build on Beckley’s argument to evaluate to what extent the United States and other countries successfully protect themselves from entanglement. Scholars should look for process tracing evidence showing that the United States chose and achieved a policy of non-intervention through ‘loopholes’ or ‘sidestepping’—and yet maintained credible alliances. Such evidence would be a powerful counterweight to widespread process-tracing evidence showing intervention motivated by a desire to uphold U.S. credibility. The concept of “alliance-induced restraint” (46) is another contribution of Beckley’s study that deserves further exploration. Do U.S. alliances restrain Washington from conflict? Debates about U.S. alliances, in addition to accounting for potential costs (entanglement, overstretch, and buck-passing), should be broadened to include this potential benefit. The concept of ally restraint connects usefully to John Ikenberry’s argument that U.S. alliances provide allies with “voice opportunities.” These (according to Ikenberry) confer influence on U.S. allies, giving them greater buy-in to the U.S.-led system; perhaps (according to Beckley) they also improve U.S. policy by encouraging restraint. In conclusion, “The Myth of Entangling Alliances” advances an important debate about U.S. grand strategy, and is a must-read for anyone who wants to weigh in on conversations about deep engagement versus offshore balancing. As noted, it raises several questions that subsequent research should explore. But the purpose of an article is to kick the can further down the road, and Beckley has given it an energetic boot. The article makes important theoretical and empirical contributions to a debate that deserves, by virtue of its great policy significance, to clatter onward. Jennifer Lind is Associate Professor of Government at Dartmouth and a faculty associate at the Reischauer Institute of Japanese Studies, Harvard University. She has recently authored “Keep, Toss, or Fix? The Future of America’s Asian Alliances,” in Jeremy Suri, Benjamin Valentino, and Stephen Van Evera, eds. A Sustainable National Security Strategy for the United States (Oxford University Press, forthcoming 2016). Lind writes on the international relations of East Asia and is the author of Sorry States: Apologies in International Politics (Cornell, 2008). She is currently writing a book manuscript about the trajectories and challenges countries must navigate as they rise to become great powers. See, for example, Stephen Brooks, G. John Ikenberry, and William C. Wohlforth, “Don’t Come Home, America: The Case against Retrenchment,” International Security 37:3 (Winter 2012/13): 7-51; Stephen G. Brooks, G. John Ikenberry, and William C. Wohlforth, “Lean Forward: In Defense of American Engagement,” Foreign Affairs (January/February 2013); Michele Flournoy and Janine Davidson, “The Logic of U.S. Foreign Deployments,” Foreign Affairs (July/August 2012); Robert J. Art, A Grand Strategy for America (Ithaca: Cornell University Press, 2003). Barry R. Posen, Restraint: A New Foundation for US National Security Policy (Ithaca: Cornell University Press, 2014); Barry R. Posen, “Pull Back: the Case for a Less Activist Foreign Policy,” Foreign Affairs (January/February 2013); Christopher Preble, The Power Problem: How American Military Dominance Makes Us Less Safe, Less Prosperous, and Less Free (Ithaca: Cornell University Press, 2009); Christopher Layne, “The China Challenge to U.S. Hegemony,” Current History (January 2008); Eugene Gholz, Benjamin H. Friedman, Daryl G. Press, and Harvey M. Sapolsky, “Restraining Order for Strategic Modesty,” World Affairs (2009); Eugene Gholz, Daryl G. Press, and Harvey Sapolsky, “Come Home, America: The Case for Restraint in the Face of Temptation,” International Security 21:4 (Spring 1997): 5-48. One of the most useful contributions remains Barry R. Posen and Andrew L. Ross, “Competing Visions for U.S. Grand Strategy,” International Security 21:3 (Winter 1996-1997): 5-53. For an update see Paul C. Avey, Jonathan Markowitz, and Richard J. Reardon, “The Competing Visions of Grand Strategy,” Paper prepared for the Annual Meeting of the International Studies Association, forthcoming 2016. Eugene Gholz and Daryl G. Press, “Protecting ‘the Prize’: Oil and the U.S. National Interest,” Security Studies 9:3 (2010): 453-485; Gholz and Press, “The Effects of Wars on Neutral Countries: Why It Doesn’t Pay to Preserve the Peace,” Security Studies 10:4 (Summer 2001): 1-57. Stephen G. Brooks and William C. Wohlforth, World Out of Balance (Princeton: Princeton University Press, 2008); Stephen G. Brooks and William C. Wohlforth, “Hard Times for Soft Balancing,” International Security 30:1 (Summer 2005): 72-108; Keir A. Lieber and Gerard Alexander, “Waiting for Balancing: Why the World Is Not Pushing Back,” International Security 30:1 (Summer 2005): 109-139. Sebastian Rosato and Michael O’Brien, “Relax America: Why Overstretch is a Myth,” Nobel Institute, Oslo, June 2012. For the overstretch argument see Paul Kennedy, The Rise and Fall of the Great Powers (New York: Vintage Books, 1987). Also see essays in Jeremi Suri, Benjamin Valentino, and Stephen Van Evera, eds., A Sustainable National Security Strategy for the United States (Oxford: Oxford University Press, 2016). In the IR literature, the terms ‘entanglement’ and ‘entrapment’ are frequently used interchangeably. Beckley, following Tongfi Kim, defines entrapment as a subset of entanglement; entrapment is when a country is dragged into war through its ally’s hawkish behavior. See Tongfi Kim, “Why Alliances Entangle but Seldom Entrap States,” Security Studies 20:3 (July 2011): 355-56; Glenn H. Snyder, “The Security Dilemma in Alliance Politics,” World Politics 36:4 (July 1984); Glenn H. Snyder, Alliance Politics (Ithaca: Cornell University Press, 1997). For discussion see Daryl G. Press and Jennifer Lind, “Red Lines and Red Herrings,” Foreign Policy, May 6, 2013. On reputation and credibility see Daryl G. Press, Calculating Credibility: How Leaders Assess Military Threats (Ithaca: Cornell University Press, 2005); Jonathan Mercer, Reputation in International Politics (Ithaca: Cornell University Press, 1996). Nancy Bernkopf Tucker and Bonnie Glaser, “Should the United States Abandon Taiwan?” Washington Quarterly 34:4 (Fall 2011): 23-37; Denny Roy, “The Impossible Price of a U.S.-China Grand Bargain: Dumping Taiwan,” National Interest, June 24, 2015. Declassified Documents Catalogue (1977), The World Situation as it Relates to the Security of the United States, National Security Council Report, 1950, 1. Dean Acheson. Present at the Creation (New York: W.W. Norton, 1969), 405. Daryl G. Press, Calculating Credibility: How Leaders Assess Military Threats (Ithaca: Cornell University Press, 2005), 140-141. Daniel W. Drezner, “Just How Entangling Are America’s Alliances?” Washington Post, August 4, 2015. David Edelstein and Joshua Itzkowitz Shifrinson, “It’s a Trap! 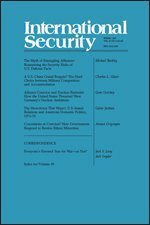 : Security Commitments and the Risks of Entrapment,” Paper Prepared for the Annual Meeting of the American Political Science Association, San Francisco, California, September 2015. Edelstein and Shifrinson, “It’s a Trap!” 10. See, for example, Kim, “Why Alliances Entangle,” 364-368; Yasuhiro Izumikawa, “Explaining Japanese Antimilitarism: Normative and Realist Constraints on Japan’s Security Policy,” International Security 35:2 (Fall 2010): 123-160. G. John Ikenberry, After Victory: After Victory: Institutions, Strategic Restraint, and the Rebuilding of Order after Major Wars (Princeton: Princeton University Press, 2000); G. John Ikenberry, Liberal Leviathan: The Origins, Crisis, and Transformation of the American World Order (Princeton: Princeton University Press, 2011).